Check out our fun fish facts for kids and learn a wide range of interesting information about fish. What do fish use gills for? How big are their brains? 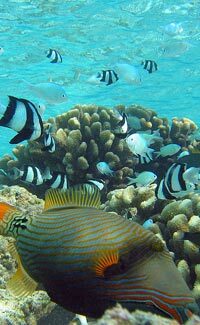 What are cleaner fish? Find out the answers to these questions and much more. Fish are vertebrate animals that live in the water. Vertebrate means they have a spinal cord surrounded by bone or cartilage. There are over 30000 known species of fish. Tuna can swim at speeds of up to 70 kph (43 mph). Relative to their body size, fish have small brains compared to most other animals. Fish are covered in scales which are often covered in a layer of slime to help their movement through water. Although jellyfish and crayfish have the word ‘fish’ in their name, they aren’t actually fish.